Finally a good TTM success to report. 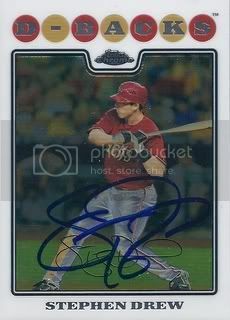 Stephen Drew signed his card from the 2008 Topps Chrome set for us. I'm hoping to see Stephen at the D-Backs Fan Fest. I've got the Bronze Refractor version of this card that I would like to get signed too. Can't wait for Fan Fest! Just over a week away! Yup! Me too. Well... I still have to get all my stuff together but in theory I'm ready.